We were in the remote 4WD-accessible Klondike Bluffs corner of Arches NP, checking out raptor nests that were active in past years. I’m learning to locate the whitewash (aka bird poop) on cliff walls underneath a perch or nest, and to put together “this seems like good habitat for bird X” with “where exactly should I look for bird X’s nest?” There are other clues, such as ravens’ propensity for harassing birds of prey, or the finding of a widely-strewn collection of years’ worth of prey bones and regurgitated pellets underneath an owl’s nest — all of which we saw this day. Tricia spotted it long before I even became aware of its presence. 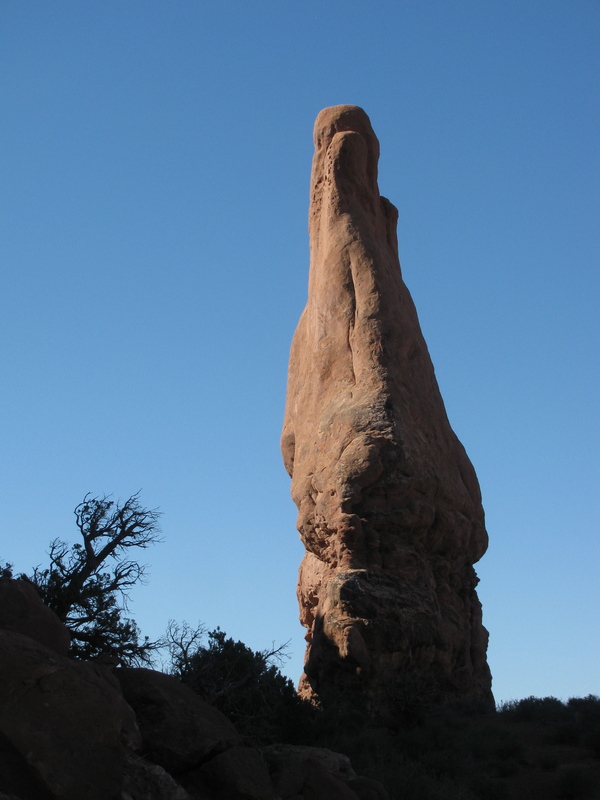 A small speck in the sky behind the sandstone pillar circled lazily, and with binoculars we soon made out its red tail. It was a dark morph Red-tailed Hawk, in the vicinity of a historically active nest. We watched it for a while, and when it disappeared to the north we circled around the huge pillar to look for a nest. Nothing but old stuff. Our stomachs were rumbling, so we plunked down on a soft rock to feast on our backpack lunches. Twenty minutes later the speck returned, and we realized we were sitting right under one of its favored perches. This time, however, the speck had another speck flying with it. A pair! We dared not move from our spot, so we tried to be inconspicuous while watching this duo catch thermals, circle around, and interact with one another as they flew. Even I, an unpolished observer, could see the sexual dimorphism (obvious size difference between male and female); in raptors the female is larger. The light male and dark female eventually left us, but a return trip to this area is in order to see if next time a nest can be located. The GPS unit in my hand did not make sense. Why couldn’t the satellites point me in the right direction? Yes, I may be 94 feet from the next destination, but which way should I go?!? I heaved a sigh and followed Tricia, whose familiarity with our bird census plot put her at a distinct advantage. I was secretly hoping I’d catch on quickly. So was she. Welcome to my first day on the job. Baptism by fire may be a good way to learn a new skill, but it is exhausting. Our day was spent flagging a large plot of land within which our weekly bird census will take place. The waypoints for each flag were in my GPS, but our job was to put the small colorful pin flags in place so that I can come out to it during the census days and look and listen for birds in a recordable, orderly fashion. We got halfway done with the flags by the day’s end and I realized that my memory banks were overloaded with trying to remember how to get from point B-6 to point B-5 without trampling the biological soil crust or heading up the wrong wash.
Orange ribbon on twigs is better than a trail of bread crumbs. Thanks, Tricia. 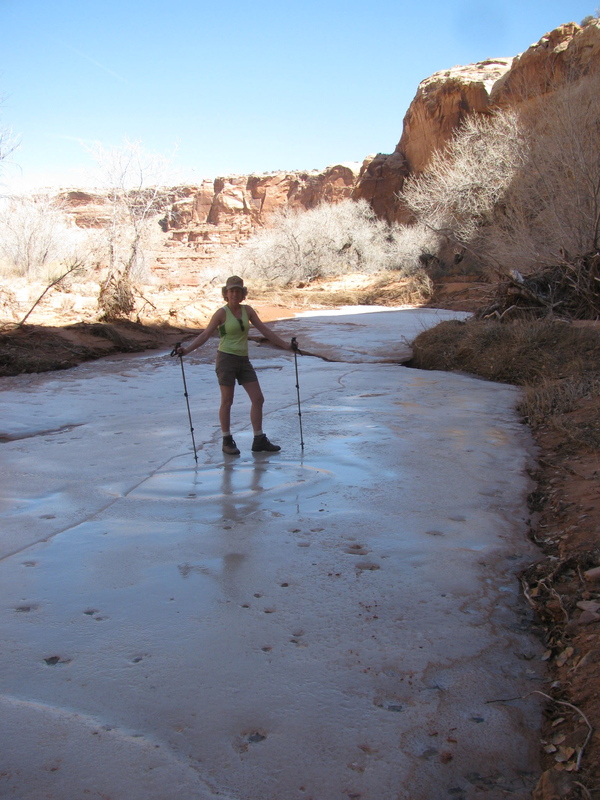 I relished being in the backcountry, in the desert, in the spring air. I disliked the feeling of struggling with technology. Tricia is patiently teaching me route-finding and basic “how not to get lost” skills, but I can tell that they come naturally to her and she may not realize how differently my brain works. 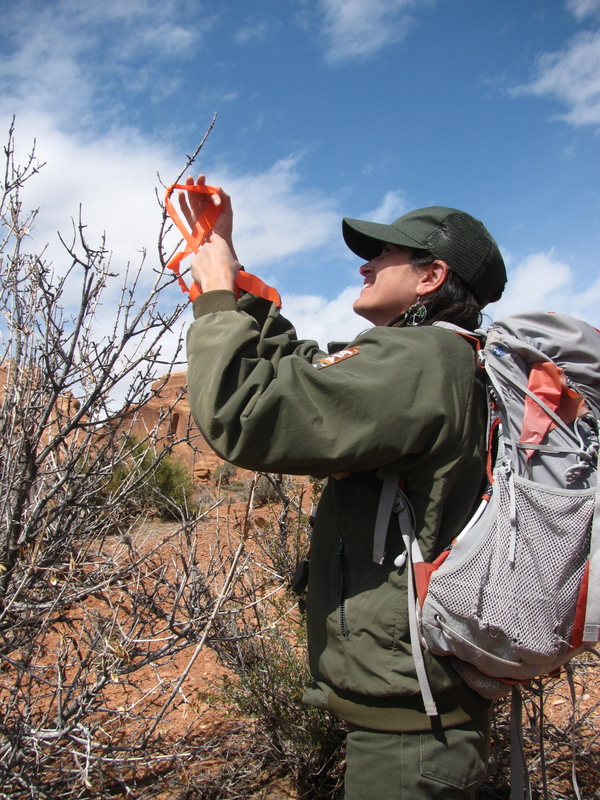 Still, as we navigate she is tying colorful plastic ribbons on juniper branches along the routes in order to keep me going in the right direction. This allows me to breathe more easily. I’m having flashbacks to the first day of third grade. I was at a brand new school and turned the wrong way at an intersection walking home; as I walked and walked and walked, things looked less and less familiar. It got scarier and scarier that September day long ago, but I figured it out, and got home an hour late. Mom was wondering what was taking so long. I was just glad to have that terror behind me. My ultimate mortification this season would be to radio Arches Patrol and report that I had no idea where I was. Have you ever been lost and scared? Driving dirt roads keeps me more attentive. Watching for rocks, washouts, cows, or encroaching sand dunes in my path makes driving more engaging. Dirt roads take me places that paved ones can’t. I cross streams by getting the tires wet instead of using a bridge. I get to cool trailheads that most of the populace won’t. Dirt roads aren’t as environmentally jarring. Not only are there fewer (or no) signs telling me how and where to drive, but the natural surface is the same color as the surroundings. Dirt roads allow me to be more in touch with the earth. It’s like going barefoot, in a vehicular sense. I can sense the lay of the land better, as huge earth-moving machines haven’t altered the contours or sliced through hills. 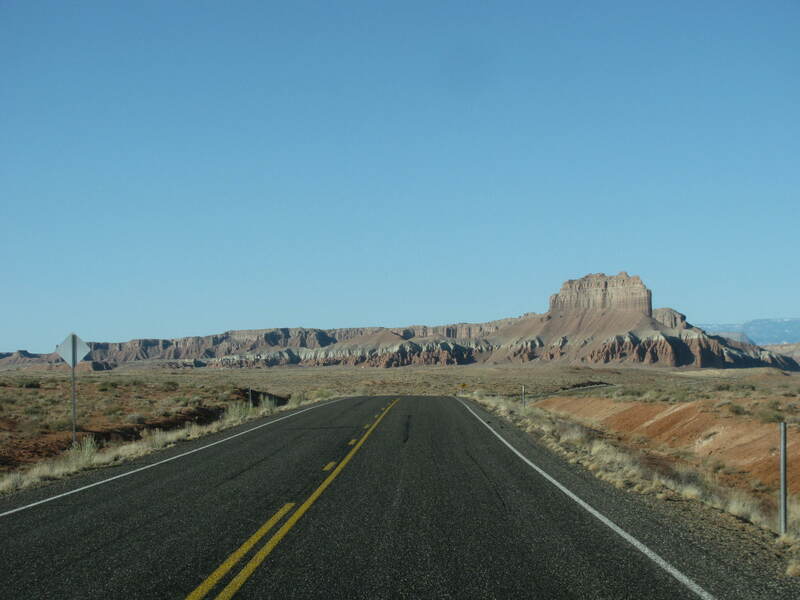 Speed limits are self-imposed instead of sign-imposed. This is not an invitation to recklessness but to increased awareness of my vehicle’s handling and the road’s condition. Dirt roads have little traffic. It’s rare to meet another car or truck. Most of the time, I’ve got the road to myself. Dirt road sights are more interesting. Calves and cows, blooming plants, kangaroo rats, decrepit old buildings, hawks, tornado-twisted trees… all up close and personal. Dirt roads demand more personal responsibility. Only some of these roads are on the map, so it’s up to me to prepare myself for travel in an unknown area. This feels right, as well as keeping me sharp. 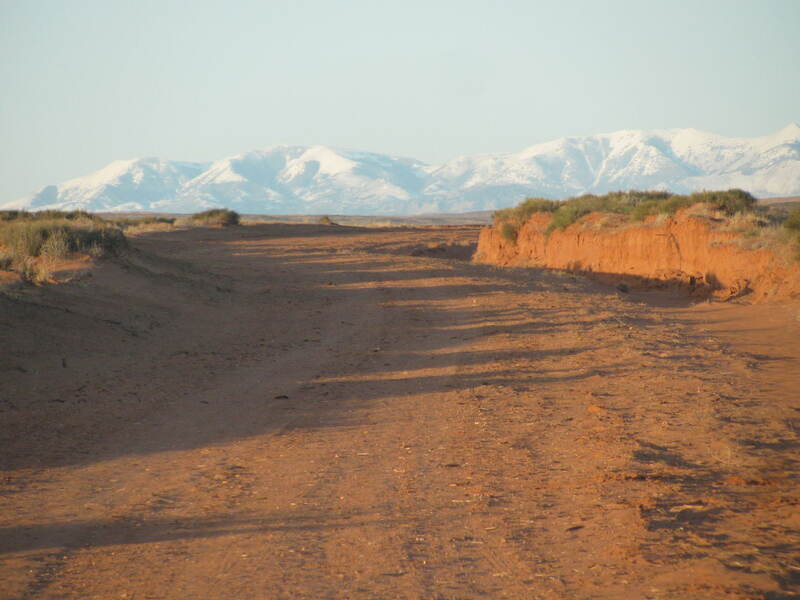 Dirt roads embody a certain sense of adventure. I don’t feel this on paved roads, usually, but dirt roads are the equivalent of question marks: Where will it lead? Does my vehicle have high enough clearance? Will I be able to turn around? Is there any gas? Dirt roads keep the riff-raff out. I mean, you’ve got to want to be going somewhere if you’re on dirt. People who drive dirt drive it with purpose. Not a lot of sight-seers, and only a few hooligans with Jeeps/OHVs. Lots of local ranchers and other colorful types. Dirt roads invite me to be aware of the weather. Precipitation in any form alters the road surface. High winds can deposit deep sand drifts. The local municipalities care for the paved roads, but on dirt I need to be aware so I won’t get stuck. Dirt roads invite interaction with other drivers. When I encounter another vehicle we always acknowledge one other — it’s that “wave without lifting your hand from the steering wheel” motion. This never happens on paved roads. Feel free to add anything I’ve forgotten. Did you know I love your comments? On the Ides of March, Barrier Creek is still frozen solid in the shade. It's nearly 70 degrees and I'm in shorts and tank top -- for one day only. Rolling over in my sleep, my cheek hit the cold pillowcase. I pulled the ten-degree sleeping bag more tightly around my head and burrowed deeper into its coziness. Light from the setting full moon was peeking around the curtain edges, though, telling me that it was a good time to get up and make tea. I keep the matches next to my bed so I can light the propane lantern without exiting my bag. That accomplished, I could now see my breath, so pulled on the nearest fleece and slipped out of my cocoon of warmth. The glorious luminescence flooded in as I pushed the curtains aside. I’d like to say I ran to the door to get an entire panorama of a 5:47 a.m. moonlit desert, but it was only two steps away. A milky bluish glow illuminated every knoll, sand dune, nook and cranny. Venus was a brilliant dot above the eastern horizon, and Ursa Major oriented me to true north. The vain queen Cassiopeia looked regal on her throne. 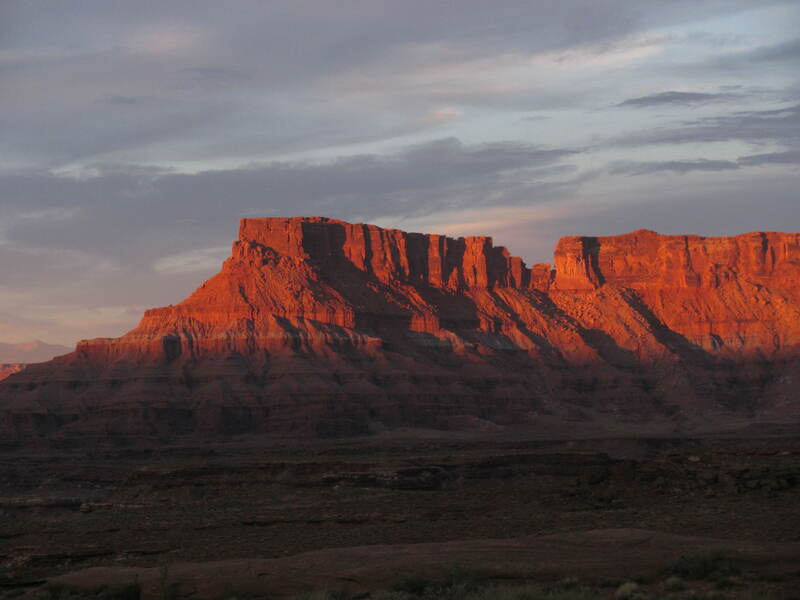 In a pre-pre-dawn aura of light, the outline of the La Sal Mountains shimmered to the east. For the first time in many days, it was perfectly calm. Shivering involuntarily in the 28-degree chill, I realized that my comfort-based mindset is slowly relaxing its grip on me. Since my job was to hike the canyon every day regardless of how bad the conditions were, I adjusted my expectations and did what I came to do. “Discomfort is the price of admission to the theatre of nature.” — Tom Brown, Jr. Describe a time you sacrificed your comfort in order to truly experience nature. Was it worth it? Know what I really want to find? Mountain lion tracks. I’ve finished eight days at Horseshoe Canyon. I’m “taking off the sunglasses” and getting to know myself better: my body, my mind, my spirit, my will. It is a slow process of learning to pay attention to small things that, in civilization, I glossed over. I’ve no watch out here. I go to sleep when I’m tired, wake up when I’m refreshed, begin my patrols after breakfast, and try to be out of the canyon by late afternoon. This kind of living without deadlines, without artificial constraints, has a wonderful effect on me. I’m sleeping better and longer. I’m eating foods that nourish me instead of fill me. I’m asking lots of good questions about my surroundings. My body is responding quickly to the intense exercise regimen and I already take fewer rests on the uphill hike out. It feels so, so good. The best part, however, may be the cobweb-clearing that is taking place in my mind. “Mental purification occurs quite naturally during an extended stay in the wilderness. Like a fountain of clear water, nature keeps pouring into our muddied cup, finally washing away the bothersome elements until we see clearly enough to feel a connection with the environment.” — Tom Brown, Jr. Does time in nature help clarify your thoughts and desires? Describe its impact on you. Do not let anybody tell you that the early native dwellers were primitive people. I have seen photographs taken of this Great Gallery rock panel on the summer solstice, and it makes my neck hairs stand up. These men and women were astute observers of the natural world, and their sensitivity to celestial happenings puts me to shame. Odd-shaped anthropomorph who bears the summer solstice shadow upon his shoulders every June. On the first day of summer, the shadow of the cliff overhang comes to rest precisely on the shoulders of an unusual, one-of-a-kind anthropomorph who looks for all the world as if he is wearing giant shoulder pads. Standing in impressive contrast to the thin, elongated floating figures populating the panel, he’d weigh a quarter ton if he were real. On the solstice, he bears the weight of the shadow of summer — perfectly and precisely — on those oversized shoulders. On the same day, at the other end of the gallery, a diagonal line of nine or ten pictograph bighorn sheep walk delicately along summer’s farthest shadow after it has crept along the cliff face. The artist placed them perfectly and calculatedly. 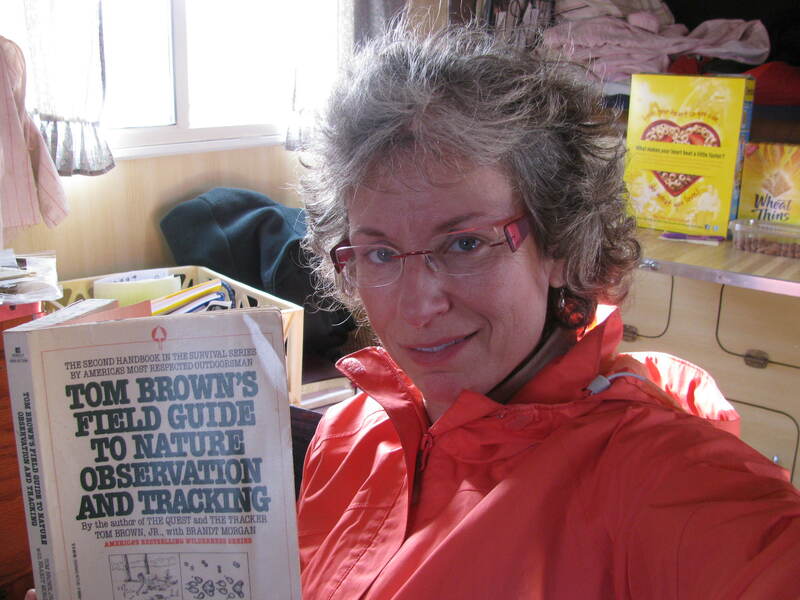 See this link if you’re interested in more about the fascinating field of archeoastronomy. This grouping: "Holy Ghost & Attendants." 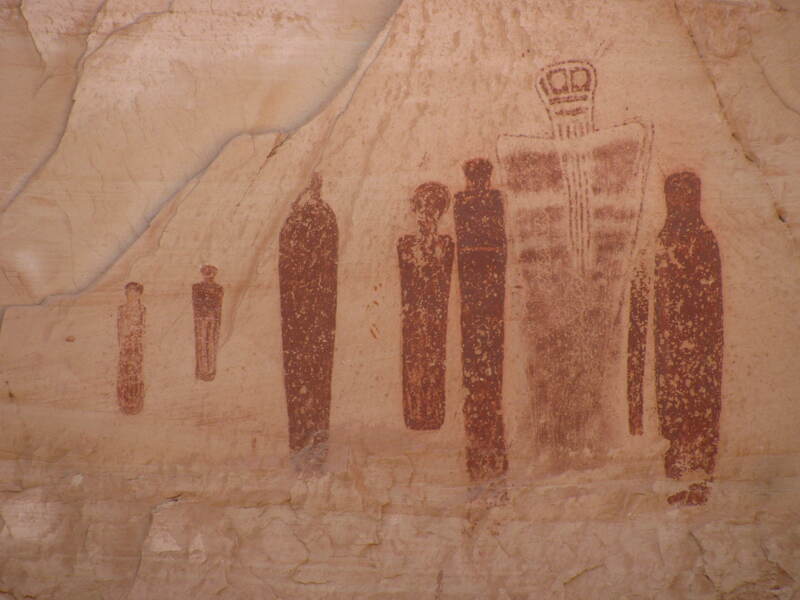 It is thought to be the earliest depiction of depth and perspective in rock art. The transparent figure is 7 feet tall and spatter-painted, possibly depicting a robe of fur. The elongated spectral figures stared out at me with blank alien eyes, and I didn’t know who was watching whom. 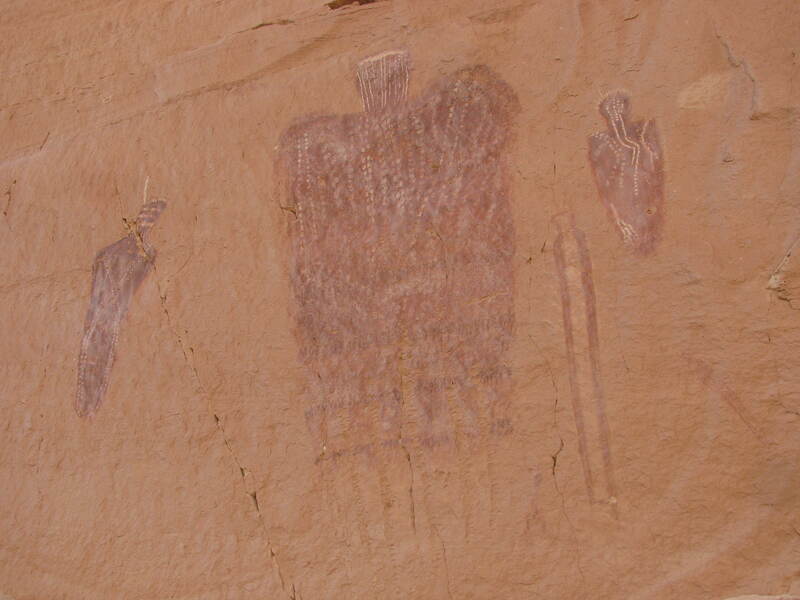 Arrayed on a panel along 200 feet of Navajo sandstone were dozens of anthropomorphs and animals painted onto the rock, mostly with iron oxide pigments. Late Archaic hunter-gatherers 4000 years ago made this special canyon their seasonal home on the nomadic circuit to collect and hunt. They had plenty of leisure time for their shaman-artists to create some of the most compelling rock art in North America. 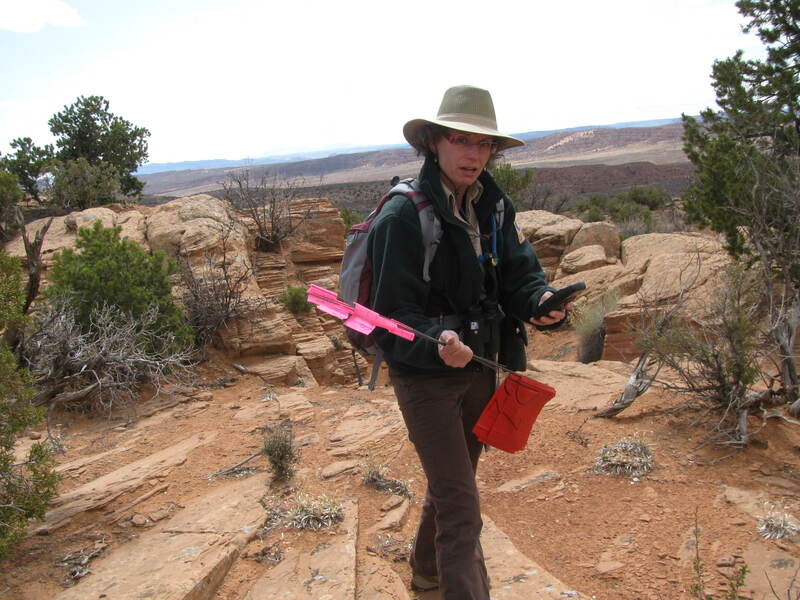 I’ve had the privilege of hiking to Horseshoe Canyon’s panels seven times. Each trek brings new discoveries — fine hummingbirds hovering around shoulders, an abraded bighorn sheep herd, indented peck marks in the exact center of the chests of ten figures, or what appears to be a worshipper bending before a ‘man’ with remarkable wings. This place is not called “The Louvre of the Southwest” for no reason. Bluejohn Canyon, Main Fork. Walls are perhaps six stories. The foggy 32-degree morning in The Maze district of Canyonlands NP started out crazily. An intoxicated reveler had driven over signs at the Ranger Station, ending up with two flat tires. Towing costs from Moab (three hours away): about $2000. Another party was lost on a back road. After this unusual flurry of activity settled down, ten of us workers hiked into neighboring Bluejohn Canyon to scope out rescue routes, find helicopter landing zones, and determine where radios work. As this canyon has recently been made famous by the movie 127 Hours, increased visitation — often by the young and reckless — has brought problems. There was a successful rescue here just last weekend, when a solo hiker got himself very stuck in a narrow section called The Squeeze. Another emergency the same day ended tragically with a fatality nearby, when a canyoneer’s rappel rope was too short and he fell to his death — leaving his brother trapped for six days on a ledge. This area is not for the inexperienced, the careless, or those with something to prove. One must come here with a deep respect for the desert, and humility of spirit as an antidote to cockiness. Needed a flash at midday. Also need to re-learn some climbing techniques. 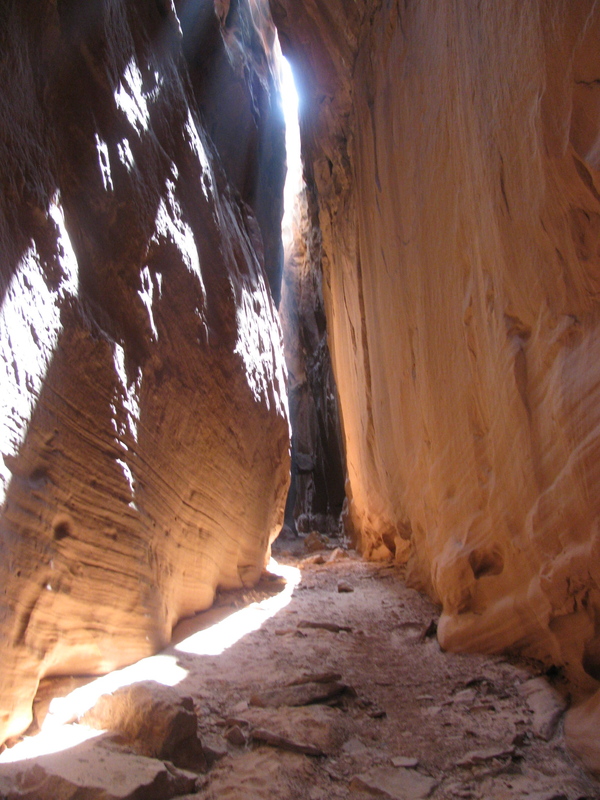 Avoiding the problematic Squeeze, our group entered the slot canyon from below and at midday found ourselves hiking in deep shade. Navajo sandstone walls shot up sixty or eighty feet or more (I’m awful at guessing distances) on both sides, leaving a small slit for light to penetrate. Flood debris told of powerful forces at work, with boulders and juniper logs wedged immovably a story or two above us. I was utterly spent eight hours later when we got back to housing; after a mandatory shower, the couch was all mine. It was my first hard hike of the season and I realized with some trepidation that I have four more 6.5-mile days in a row ahead of me. It’s not the mileage as much as the 750 foot elevation change each day, with the “up” when I’m tired… but I take solace in the fact that I will turn into a Lean Mean Hiking Machine over the next weeks and months. 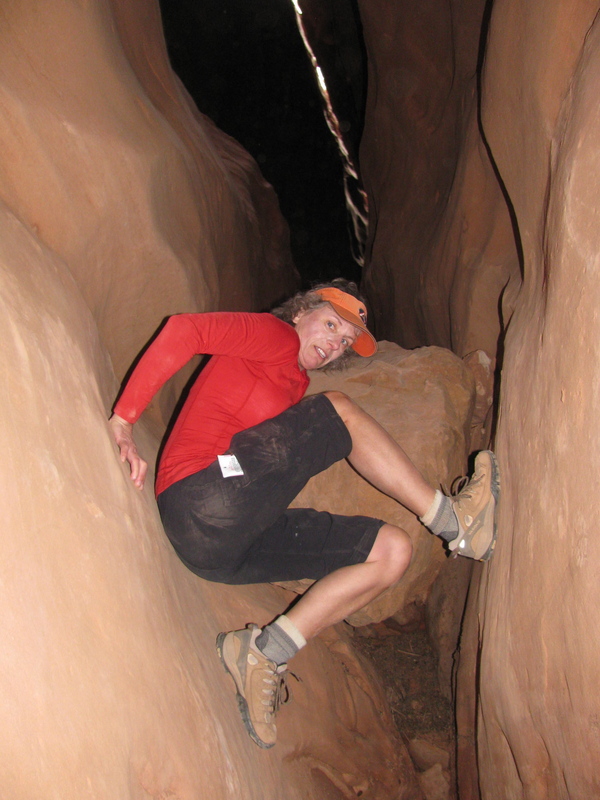 Please comment: What was your most dangerous outdoor experience? Tricia took this in the middle of the night. I was looking for Mrs Mouse. Scritch scritch scritch chew chew chew at 2 a.m. in a remote trailer can mean only one thing: I have a companion. 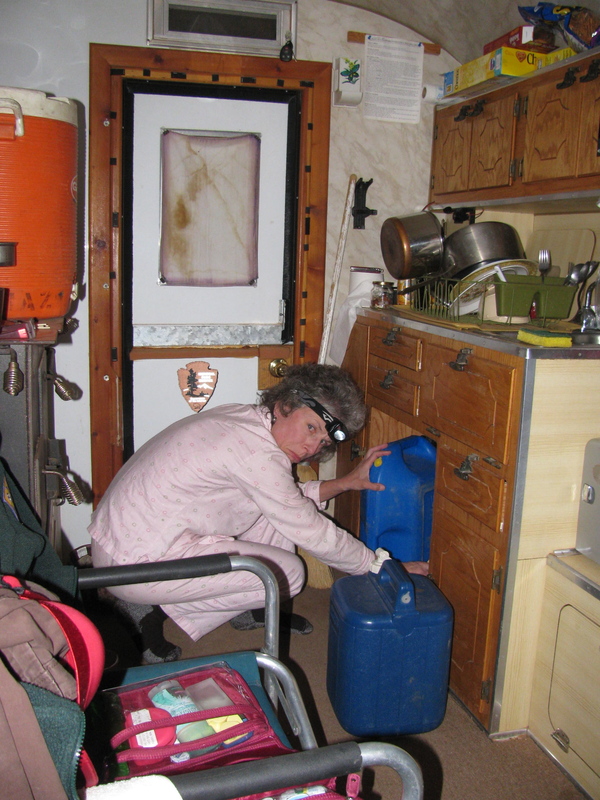 I slipped out of my cozy sleeping bag in the general direction of the sound, and sure enough caught her plump body and beady little eyes in my headlamp just before she disappeared out the hole under the kitchen sink. Just her fleshy pink tail remained to taunt me. No steel wool around here, so I looked in the tool kit and selected a large hammer whose handle perfectly filled the hole. Jamming it in place, I hoped Mrs Mouse would be frustrated enough to give up. I’ll keep my food in my car. Feel free to tell a good mouse story in the comments section.